The company has its claws in almost everything people do on the internet. During a keynote about privacy at F8, Facebook Chief Security Officer Alex Stamos shared an image of the world that used light to show the sheer size of the company's network. It was intended to highlight all the places where people are using a Facebook product and, as you might expect, there weren't many dark spots. 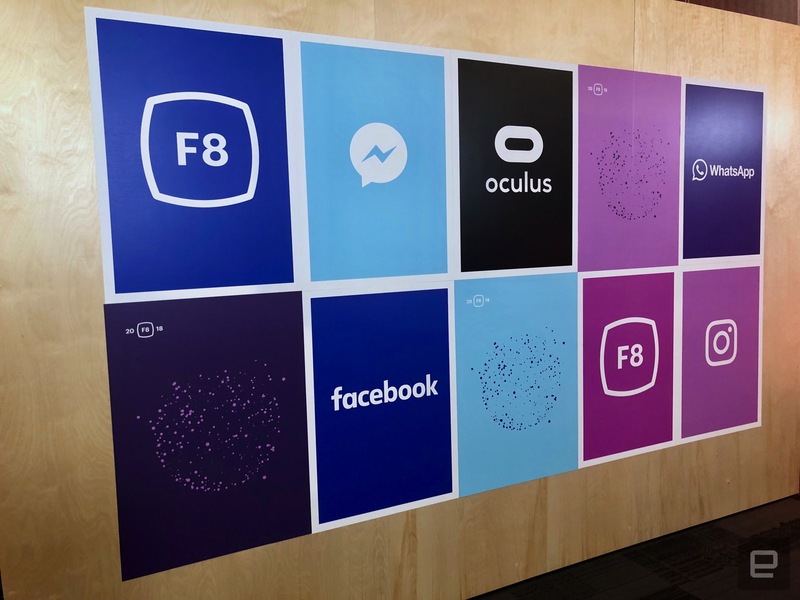 This year, Facebook's F8 developers conference was bound to be different. After all, the company is still dealing with the aftermath of the Cambridge Analytica (CA) data privacy scandal. But Mark Zuckerberg said during the opening keynote he was ready to "move forward," and instead he came to talk about how Facebook plans to light up the rest of Stamos' map. The goal, Zuckerberg said, is to make the world smaller by building products that will help people connect in "meaningful ways," no matter where they are or what device they're using. With more than 2.2 billion monthly active users, Facebook alone is already hard to escape. How else will you find out about your next high school reunion or when your distant cousin has a baby? For millions, it's their preferred means of communication, and for an alarming amount of people, it's how they get their news. Facebook has also found ways to inject itself in people's lives in an almost unthinkable way. If you want to donate to charities, you can do that on Facebook. Want to promote your band's show, it has you covered. And with Groups, which it now plans to make more of a centerpiece of its site, you can be in touch with like-minded individuals whom you may never meet in person. This reach is magnified further when you remember that Facebook owns some of the other most popular social apps and services across the globe. This includes Instagram, which has more than 800 million monthly users (and will likely hit a billion soon); WhatsApp, which has 1.5 billion monthly users (almost as many as Facebook); and Messenger, the standalone chat app that now has more than 1.3 billion monthly users. Oh, and let's not forget about Oculus, which Facebook bought in 2014 and is arguably the most promising virtual-reality company. Oculus just launched its first mobile VR headset, the Go, with a $200 price tag that puts it in impulse purchase territory. VR hasn't gone mainstream yet, but Facebook has a chance to make that happen with its Oculus Go. One of the ways it plans to do that is by making virtual reality social, with features that will let users "hang out" with others in digital, 360-degree spaces. You can be watching a movie with friends and it'll be like going to the theater, except you won't be there physically and you'll have a headset strapped to your face. Facebook is also rolling out similar experiences for live events, including concerts and sports matches. All of this is to say Facebook has something for everyone, whether you want to stay in touch with your older relatives (Facebook), make new friends (Instagram), chat with friends overseas (WhatsApp) or soak in the future of entertainment (Oculus). And as the company continues to grow, it will only collect more data on you and everyone you know. Simply put, Facebook doesn't just want to be a part of your life, it wants to be your life. And the company isn't done yet. At F8, it announced that it would be taking on Tinder with its own dating service, which is scheduled to launch in the next few months. With the billions of dollars it makes every quarter, Facebook could've just bought Tinder and called it a day. But why spend all that money when it can just build a similar experience and, perhaps, make it even better? Facebook's hefty user base will make it an immediate threat to other matchmaking offerings. We don't know yet if Facebook's matchmaking feature will be a hit, but with the amount of data it already has on people and the resources at its disposal to create seamless apps, no one will be surprised if it simply makes all other dating services obsolete. Case in point: When the company reportedly failed to buy Snapchat in 2013 for $3 billion, it went ahead and just cloned its most popular feature, Stories, which is now a big part of the Facebook and Instagram apps. It didn't take long for Snapchat to start losing users as a result, and it also affected its bottom line, as advertisers flocked to Facebook's product. Instagram is now at 300 million daily active users, compared to Snapchat's 191 million. It's clear this has paid off for Facebook, which says Stories will soon be the most popular way people share updates. "We should be concerned with the growing reach of Facebook," said Michael T. Zimmer, an associate professor at the School of Information Studies at the University of Wisconsin-Milwaukee. "The rise of Messenger -- especially once it spun into a standalone app -- was a big step in its reach into our daily activities. But more than that, the ubiquity of 'Like' buttons and 'Login with Facebook' features across the web means it is nearly impossible to avoid touching Facebook in your daily online activities." Zimmer added that whether or not users take control of their privacy settings when they post on Facebook, which is what Zuckerberg focuses on when asked about privacy, nearly everyone will still be subjected to "Facebook's immense apparatus of tracking and data collection." "Either you give enough people in the world what they want, or you don't succeed. And Facebook over and over again is giving people what they want." Other academics don't see an issue with Facebook becoming too powerful. "The success of Facebook in these various things that it does, and the fact that it just keeps doing more and more, is a reflection of the fact that [it's] doing something right [and] that people are enjoying by and large what they're doing," said Paul Levinson, professor of communications and media studies at Fordham University. He noted that while it's obvious that Facebook has made mistakes and it's not perfect, its success shouldn't come as a surprise. "Either you give enough people in the world what they want, or you don't succeed," Levinson said. "And Facebook over and over again is giving people what they want." Some have even raised the "M" word when talking about Facebook. Sens. Lindsey Graham (R-SC) asked Zuckerberg directly during his congressional hearing: "You don't think you have a monopoly?" "It certainly doesn't feel like that to me," the embattled Facebook CEO answered with a nervous smirk, which drew laughs, including from Graham. It may not feel like it to Zuckerberg, but the truth is that Facebook really doesn't have any competition -- Twitter and Snapchat combined have around 400 million monthly users. That's nowhere near Facebook's 2.2 billion -- and that's not even counting Instagram or WhatsApp. Even with the massive web it's already created, Facebook says there are still more than 3 billion people who don't have access to the internet and by extension, its services. It wants to change that by building fast and cheap networks that will make the internet accessible in every part of the world. Theoretically, whether or not you use Facebook is up to you, though at the end of the day it may not feel like you have much of a choice.